You all know that Dewey & LeBoeuf, filing for bankruptcy liquidation today, is the largest law firm to ever go bust. And that means a ton of people are now out of work, either scrambling to hitch their wagons to new firms or looking to start their own practices. Because having your own firm is, to many, the Holy Grail of a law practice. Sure, some like the consistent fat paycheck, but the ranks of lawyers are filled with Type-A personalities who fantasize about practicing law the way they want to do it, not the way some other Type-A knucklehead has been telling them to do it. There are only about a gazillion things to think about in starting your own shop: office space, support staff, technology and money to keep you going, to name a few. But today’s topic will be self-promotion and social media. And I don’t mean this in a good way, as in here’s how to go out and be famous on Twitter. No, no, a thousand times no. Instead I’d like to warn you about them, and help you save your soul. You’re welcome. Pull up a chair, and let’s review some of the more dreadful attorney marketing over the years. We’ll start in the toilet. And when I say start in the toilet, I am perhaps, exaggerating a bit, because what I really mean is over a urinal. Now I know that no one from BigLaw would ever stoop low enough to advertise over a urinal, but you should know that marketing opportunities come in all shapes and sizes and that someone, somewhere might try to sell you something that doesn’t quite pass the smell test. Selling is what marketers do, and dreams of a steady flow of clients is what many lawyers want to hear. That is always the salesman’s pitch, figuring out what the mark wants to hear. (“Would you like to have more cases?”) But I don’t suggest you take the ghoulish pitch from the funeral home website. Or that you advertise in a jail. I won’t belabor the point of lousy marketing strategies, because I think you get the picture. If you’re going out on your own — and letting everyone know you are out on your own — you may start fielding inquiries not only from the commercial end of the pool where you once swam, but also questions from friends, family and neighbors that may focus on the consumer end of the law. That means criminal, personal injury, matrimonial, residential real estate, etc. Some of you will dabble, not wanting to turn away business and curious as to how you might expand your practice. And some of you might actually like it, as your clients are likely to be real people instead of corporations. In addition to getting paid, you might get the warm, fuzzy feeling of actually helping a fellow human. But because these are people that don’t usually use legal services, it is also the domain of the mass advertiser. So, for my new ATL readers, this is the thing to remember above all else: Marketing is part of our ethics codes. So if you outsource your marketing you outsource your ethics. It isn’t complicated; the marketer is your agent that is speaking for you. When the marketer calls and emails, you ask yourself: Is this the type of person I want to hand my law license to? You may think that the company is reputable. But that is only because you really haven’t been watching the way some of us outside the BigLaw cocoon have been watching. Instead of giving examples of how the piddling marketing companies screw up (urinals, funeral homes, jails) — perhaps you figure you’ll just be safe and hire the biggest and best? — let’s look at the Goliaths of the industry to see how well they have done. First in the dock is Martindale Hubbell. One day it seems, some comment spam turned up on my blog. From them. That’s right, the great revered king of all kings in the legal directory business, was using black hat techniques to drum up business. By basically coming over to my place to stick a billboard for itself on my lawn. How did that happen? Because they weren’t actually doing the work, but had simply outsourced it to others (who may in turn have outsourced it yet again). So you should assume that no matter who you hire to market for you, it will end up being done by some kid in Bangalore, India who knows less than nothing about the practice of law and our codes of professional responsibility. Next in the dock is FindLaw. What was their faux-pas? Creating crap. This company decided to create fax-blogs that did little more than repeat local news stories of accidents and then end with a links to the people that pay them. They were hoping that the people in the accidents would Google themselves and find the story and then click on the links to the lawyers that had paid FindLaw. At one point, I actually found them using the name of a dead child in the subject heading in order to lure in the family. Ask yourself: Are these the types of people that you want to hand your ethics over to? So this is the essence of what happens: The lawyer outsources marketing (and reputation) to a non-lawyer marketing company, which in turn hires or outsources your marketing (and reputation) to yet other people. Don’t say you weren’t warned. Welcome to the world of attorney marketing. Please drive carefully. I’m in the ABA Blawg 100 Again (But the LexisNexis Listing Makes Me Shudder) -Updated! Today we see a face-off: It’s the American Bar Association v. LexisNexis. First up, the annual ABA Blawg 100: Go figure. They still like me. For the fourth year in a row, the ABA Journal has picked me as part of its top 100 law blogs in the country, out of about 3,500. Thank you. Yes, I have an ego. Yes, I appreciate it. I haven’t always been completely charitable. When they first started doing this thing, they completely missed the personal injury field. They learned from their mistakes. They added two the next year and had six the year after that. This year I’m joined with some superlative blogs in the tort category: Overlawyered, Marler Blog, Drug and Device Law, Abnormal Use, and Jackson on Consumer Class Actions. Do they have all the best blogs? No. They can’t. Because there are more good ones than the category can hold. This is completely subjective, of course, but there isn’t a dog in the bunch. My only real pet peeve is that, once again, they are going to have a beauty pageant vote for the best. Since there really is no such thing as “best,” I think everyone understands and appreciates that it’s all in good fun. But still. If they want to give out “best of” prizes I think they ought to let the law bloggers do the voting, since we are the ones most familiar with the rest of the blogs. While it might be nice to have bloggers drive their readers to the site to vote, that just gives a sense of politicking for votes. And politicking has been a problem and zapped some of the fun from it. There was one blogger two years ago, Neil Squillante from TechnoLawyer, who ran a sweepstakes to award $500 to two people and $100 to five others who cast their votes for him. He actually retained a lawyer for it. TechnoLawyer will never live down that taint. Now on to the challenger in the law blog contest business: LexisNexis. They named me one of the top 25 tort blogs. I provide the link (coded “NoFollow“), despite what I am about to write, because there are some good blogs in there. But there are also some real barkers, like two faux-blogs from the Illinois firm of Levin & Perconti that are little more than thinly disguised ads for the firm. LexisNexis apparently wasn’t too concerned about quality, as those aren’t the only ads posing as blogs. High praise considering that some of the blogs aren’t really blogs. There seems to be some disconnect between the promotional words and the actual content they listed. We would appreciate having the LexisNexis Litigation Resource Community linked to your site as well. Our visitors appreciate the links to valuable sites, and of course reciprocal links to high quality sites increases the search engine optimization for both of our sites. Makes me shudder. LexisNexis is using the same spammy language as all the other hucksters on the web. It reminds me of Martindale-Hubell spamming me a couple years ago. Wait! Did I say Martindale-Hubbell? Are these two companies joined at the hip? While the ABA Journal obviously wants traffic — and why wouldn’t they since they are a legit magazine? — they’ve never, ever asked anything of me, in crass terms or otherwise. Let me be clear about this. It’s not an honor to be lumped in with crap. Because it shows that the LexisNexis editors — to the extent there is anyone actually reading the content of the sites as opposed to just finding 25 to list — don’t really give a damn. This LexisNexis nonsense, it seems pretty clear to me, has just one purpose, to juice their Google pagerank so that they can appear higher in the rankings for any of the products that they sell. It’s little more than link bait. So in the match between ABA and LexisNexis, it is ABA by knockout. In the first round. In the first minute. The battle wasn’t even close. Anyway, all that stuff aside, it’s time to deal with the ABA voting. And to handle that auspicious detail, I will now trot out the same campaign manager I’ve used the past three years. Paris has so far managed to lose every election for me, and I have every confidence that she can pull it off again. If you want to vote, here is the link. But remember, the best part of the link is that it gives a nice roll of good blogs that are out there, some of which you may not have heard of. So leave here, go there, and rummage around to see what you find. But stand very clear of LexisNexis. Note to LexisNexis — it will take you awhile to get the mud off your face for this one. I thought I was done blogging for the week, but I just learned that FindLaw, another one of those “venerable” names in the legal biz, has swiped my blog name. I kid you not. They’ve created The New York Personal Injury Law Blog (all links here coded as “NoFollow”). The person that allegedly writes it, “Emily Grube,” doesn’t even show up in the New York directory of attorneys when I checked. She also writes the Philadelphia Personal Injury Law Blog, The New York Criminal Law Blog, and who knows how many others that are in start-up phase. And, surprise, surprise, when you read the “articles” that are written they have a link at the bottom with the “call to action” to contact one of the lawyers that pay FindLaw to promote and advertise for them. As it happens, I know many of those on that list, and some are friends of mine. And you can bet your last dollar that I will let them know what FindLaw is up to, and they can decide for themselves if this is the type of conduct that they approve of. How pathetic is FindLaw, anyway? Last year they were busted for selling links on their editorial content. Two weeks ago Scott Greenfield danced all over them for using the names of local criminal defense attorneys in their spammy solicitation to him. Of course, one may try to say that my blog name is merely descriptive. But after three years of blogging and, I think, a fair amount of recognition across the legal blogosphere, it has taken on a distinctiveness all its own. I thought about sending them a note to alert them of my site. But then I realized that if they didn’t already know about my site, then they were really just too pathetic to believe. I mean, what lawyer would start up a blog without checking to see if the name was being used? Find Law, which is owned by Thomson West, is an agent for the attorneys that pay them money for promotion. I suspect that these good folks just assumed that Find Law would act in ethical, proper ways and not try to sell links or steal blog names. But this is what their agent has been up to. Do law firms really want to be associated with a company that acts in such a swarmy way? FindLaw, I’d like you to meet Martindale-Hubbell, both of whom seem not-too-far removed from LegalX and a bazillion other sites hustling their way across the web without seeming to care about their reputations. They’ve ripped off my name now. Is yours next? Martindale-Hubbell previously reported that it suspended a company that sent comment spam to blogs, of which mine was one. They also offered a full accounting of the episode. Today they confirm that the spammer has not just been suspended, but that they “have subsequently stopped working with them.” At my invitation, they have now given an accounting of the incident. “In late September, the UK Martindale-Hubbell team hired an agency to help us drive traffic back up on our co.uk. site. SEO was a core component of this program as a new directory structure for the site had caused significant issues with our organic rankings. It was our understanding that we would get to approve everything the agency did on our behalf, however unfortunately in this instance that did not take place. The agency we worked with, or an agent acting on their behalf, unfortunately posted some garbage comments without our knowledge. We do not condone spamming under any circumstances, and once we discovered that these generic posts had gone out we immediately instructed the agency to halt all work on our behalf, and have subsequently stopped working with them. As we mentioned, we have also requested that the agency provide us with a list of all blogs affected so that they can be contacted individually. There are two interesting things about this episode. First, that Martindale-Hubbell says it is common practice to outsource attorney marketing to others, and second, that MH seems frantic after having been knocked off its #1 perch by upstart Avvo.com. ET: After MH outsourced to Gilroy’s company [Conscious], did Gilroy outsource it elsewhere? DB: Yes he did. Outsourcing is a common practice to help reduce labour costs. 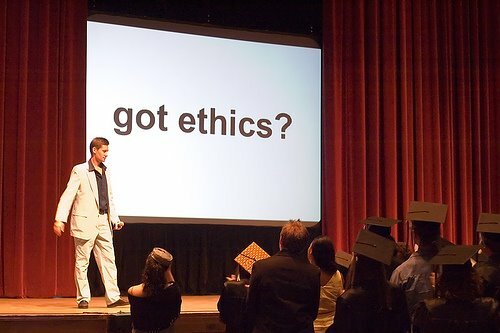 As I’ve intoned before, attorney ethics and marketing are deeply connected. So when marketing gets outsourced, so do ethics. 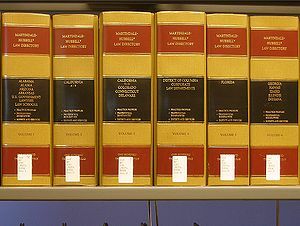 But the acknowledgement by MH that it is “common practice” for the attorney search services to, in turn, subcontract out the marketing they were hired to do, means that attorneys hiring a marketing company essentially run the “common” risk of their ethics being outsourced to low-cost mystery marketers. It’s also worth noting that the “experts” in the attorney marketing world include disbarred or inexperienced attorneys. Who, exactly, can you trust, when even the largest of attorney search companies feels it’s OK to send your ethics to the low bidder? The second thing worth noting is the desperation of MH to reclaim its top spot in the attorney search arena as they worry about becoming an endangered species. Because there are beaucoup bucks to be mined from people that will — notwithstanding the risks of outsourcing their ethics to strangers hired on the cheap — ask others to advertise for them without understanding the ramifications. If you hadn’t noticed, Avvo appears to have surpassed MH’s lawyers.com in the number of unique visitors they get each month. One of those two companies isn’t happy about that. Of course, if you look at Avvo’s site, you’ll see that it is missing the “attorney advertising” mark that New York says is mandatory for attorney web sites. It’s like the wild west out there. Eric – Thank you for giving us the opportunity to tell our side of the story. Unfortunately, in your accompanying commentary you asserted that “Martindale-Hubbell says it is common practice to outsource attorney marketing to others.” That is not at all what we’ve said or done. The agency we hired was engaged to provide SEO services to our co.uk. site — not to fulfill any marketing services for lawyers. My response: SEO and attorney marketing are interrelated. Martindale-Hubbell, the 140 year old attorney directory company, has responded to questions raised after it’s agent was caught sending spam to law blogs. Among its promises are a full public accounting for the incident(s) and an attempt to notify all of the law blogs that were defaced by its spammer. Earlier this week I noted that MH was spamming my blog. MH subsequently acknowledged that they outsourced marketing to another company that spammed blogs, and also offered to answer questions about the incident. ET: If MH claims to be a leader in social media, why is it outsourcing the social media to others? DB: In this case we were outsourcing our SEO to an agency, just as we outsource plenty of other Web pieces. The team in the UK (MHI) recently changed to a new CMS [ed: content management system] and as a result we saw a drop off in traffic to our co.uk. site. To quickly address the issue, we hired an agency in late September to help bring our traffic back up to pre-CMS deployment numbers. We didn’t have the bandwidth on our team to do it ourselves. We hired the agency with the understanding that we would approve everything and that has not been the case. The agency’s understanding was different. We are now discussing why there was a miscommunication. All SEO work with this vendor has been halted whilst we investigate. ET: After MH outsourced to Gilroy’s company, did Gilroy outsource it elsewhere? ET: Will MH make the results of its internal investigation public, so that others can learn from it? DB: Absolutely. We’d be happy to have somebody do a guest blog post on the matter here if you’d like? DB: I can’t answer this on behalf of another company, but will try to find out. The quote and link you used above actually relates to their directory submission service, so I don’t know whether the screenshot applies in this instance. ET: Will MH follow-up with each of the blogs that were defaced? DB: Per the above, if we can identify them, absolutely. ET: I note on your blog that MH is holding a webinar on social media, which is “a series of online events bringing together some of the legal profession’s top social media evangelists to share their knowledge and tips on the practical uses of social media.” (Irony noted.) Will you be using this experience as a teaching moment? DB: We’ve certainly learned from the experience, yes. That said, our webinar series is more about bringing experts together to discuss key issues than it is about us (MH) broadcasting our opinions. We’re not for a minute defending spamming, nor have we ever done so, I’m not sure whether there’s a teaching moment in there. Don’t spam is about the extent of it.